The traditional preparation for this classic Roman dish using no cream. The summer before my freshman year in high school, my family moved out of San Francisco and to a neighboring town a few miles away. This meant that I spent my first year in a new school trying to find my place in a sea of new faces. I was extremely shy which severely limited my opportunities to make friends. I was too timid to join a club or participate in sports so the friends I made were those who sat around me in class. At least by the end of that first year I knew a small cluster of people I could consider friends and I didn’t feel so much like the new girl. During my sophomore year, things continued to improve. 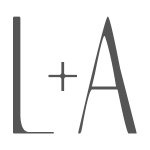 I had become acquainted with most of the people in my class and also some upperclassmen but it was a passing comment from a friend that prompted an important revelation that I have never quite forgotten. Me? A snob? I couldn’t believe it, but I suppose it was a valid observation to make about me at the time. I was so petrified of other people that I hid behind a mask of indifference. I never said hello first when walking down the hallway for fear that I would be ignored and humiliated. I never dared show that, yes, I wanted to smile and greet you but only if I knew that the gesture would be reciprocated. Oh, to be young and insecure. …well, maybe in one part of my life I do sometimes stick my nose up in the air. When it comes to pasta carbonara, I am quite picky. I am a stickler for its traditional preparation of using no cream. Pasta carbonara is a humble dish. If you love it as much as I do, you are familiar with its simple ingredients: eggs, guanciale, Pecorino cheese and ground pepper. I continue to have trouble finding guanciale so I usually use deli bacon (not heavily smoked) or pancetta on occasion. Pecorino-Romano is the preferred cheese in Rome where this dish originated, but Parmigiano-Reggiano is also widely used. Honestly, I don’t use Pecorino too much as it is a bit too salty for me. As for the eggs, the number of eggs used varies from recipe to recipe. 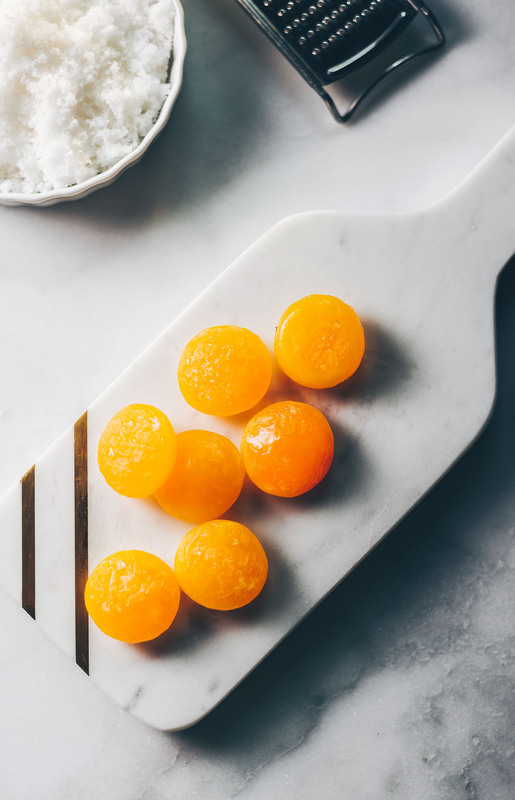 Do you use only egg yolks or the whites too? There may be minor variations in proportion for these aformentioned ingredients but cream should never be part of the equation. Just my (not so humble) opinion. I have nothing against creamy pasta dishes–love them–just not in my carbonara, please. Here is the way I have learned to prepare mine over the years. It took a bit of trial and error to not end up with scrambled eggs when “cooking” the sauce but I finally got it right. I hope you like it. Bring a pot of water to a boil but don’t start cooking your pasta until you have prepped the “sauce”. It is important that the pasta be freshly drained from the pot when you use it. It is this heat that will cook the eggs for the sauce. To prepare the sauce: In a bowl large enough to accommodate the pasta, whisk together the eggs, egg yolk, cheese and several turns of ground pepper from a peppermill. Set aside. When you are ready to fry the bacon, you can also start boiling the pasta. Cook the bacon in a pan until crisp. Take the pan off the heat and leave the bacon to cool slightly with its rendered fat for 3-4 minutes (about the same time it will take for the pasta to finish cooking). When the pasta is ready, drain it lightly so that you have just a bit of pasta water still dripping from the colander (don’t rinse!) and immediately add to the egg/cheese/pepper mixture. Add the bacon and drippings (if you have too much rendered fat, leave some out) and toss quickly to incorporate the sauce into the pasta. If the timing is right, you shouldn’t have any scrambled egg bits but it’s okay if you do. It will be better next time. :)Taste for seasonings. You shouldn’t need salt at this point but add if you wish. I always add more pepper to mine. Serve immediately. I think it happens to many of us, doesn’t it? This pasta looks fantastic, very light looking for a carbonara! Beautiful pasta…and of course very tasty! Great photos Jean! From one carbonara snob to another–cheers! I like the touch of parsley; not something I usually add but will dress mine up next time I make it. My Zia Bruna would approve, I think. 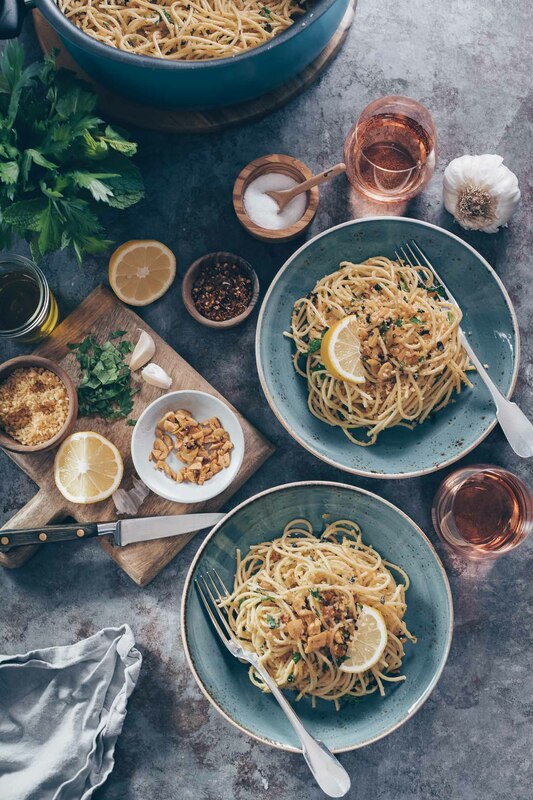 This pasta alla carbonara looks so delicious! I’ve always wanted to try and make it from scratch, but haven’t tried again since it turned out terribly for me YEARS ago. Time to get back on the horse! Lovely recipe and photos. Thank you for inspiring me! 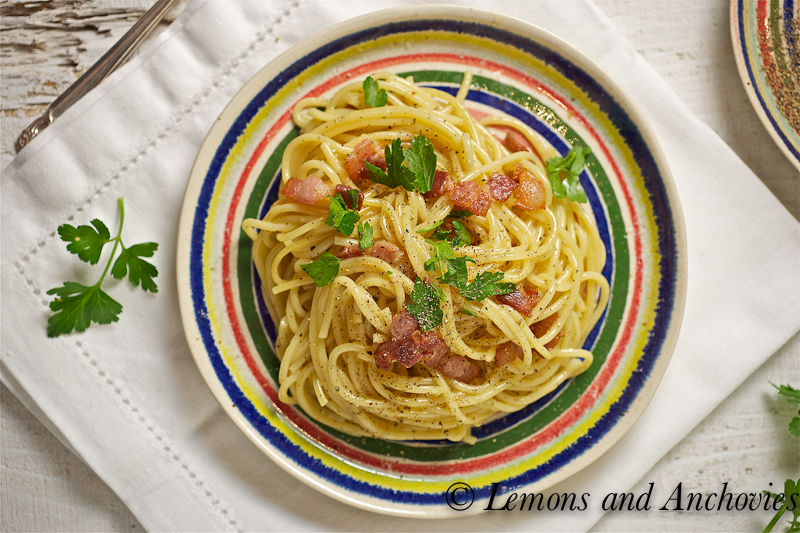 This is way better than most pasta all carbonara recipes I’ve seen–it’s that it isn’t drowned in sauce, I think. BTW, I know what you mean about the snob thing–I’m naturally a little shy, and it always leads people to think that I’m aloof when really I’m the opposite! Gorgeous pasta! Glad to hear I am not the only one; I have heard that comment before about being shy and thinking I was a snob too! I have tried to over come it as well, but it can be hard sometimes! your pasta looks beautiful! simple ingredients yet so decadent…love it! It’s definitely tough to be the new kid at school…isn’t it funny to find out how others perceive us though? It can be so different from how we actually feel. Love this dish, but I’ve never made it at home — I need to give it a try! Your story describes exactly how I was in school and around new people,shy. I’m still quite shy when I don’t know people and have also been told that they thought I was a snob. Its funny how people mistake shyness for snobbery. Your recipe sounds delicious and photographs are beautiful. Thanks for sharing! What a wonderful dish! My family would love it, especially since there’s bacon in it!! This will be on my menu this week!! Thanks for a great recipe! Hi Jean! Carbonara has been one of my favorite pasta since we made it in home & economics class in middle school. I think I learned somewhere that Americans like to use cream but I had never tried cream version. We need ingredients that we normally have in the fridge, so this has been my go-to recipe when I actually don’t have many things to cook with. I am so happy you posted it because I know you are particular about how Carbonara should be made, and I like it to try very authentic method as much as possible. I will try your recipe next time I make for sure. I would have been the same way! People tell me I look intimidating, but I’m not! I promise! 🙂 This carbonara looks insane! I only use the yolks, I find it makes the pasta nice and creamy. Delicious plating!! Yum!! It drives me crazy when I see pasta carbonara on a menu and its a cream sauce with peas and bacon. I don’t mind mixing it up a little bit, but that is too far. 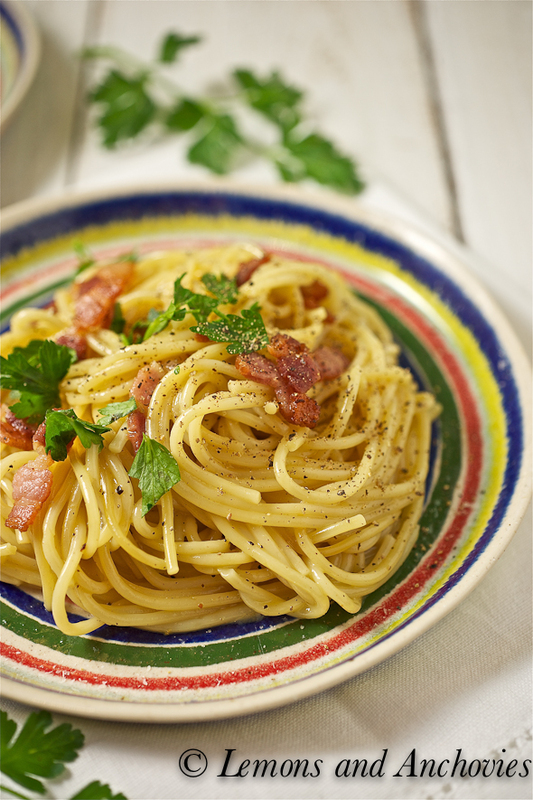 Love your version…it looks exactly like a carbonara should. Your carbonara looks fantastic, just like I had it in Rome. Of course ‘pancetta’ or ‘guanciale’ would be best, but I could have your dish every day! What a nice looking carbonara dish! It’s one of my favorite pasta dishes. Thanks for the great recipe! you and snob !! NO WAY. Jean, you have managed to make this humble dish into something so undeniably elegant. 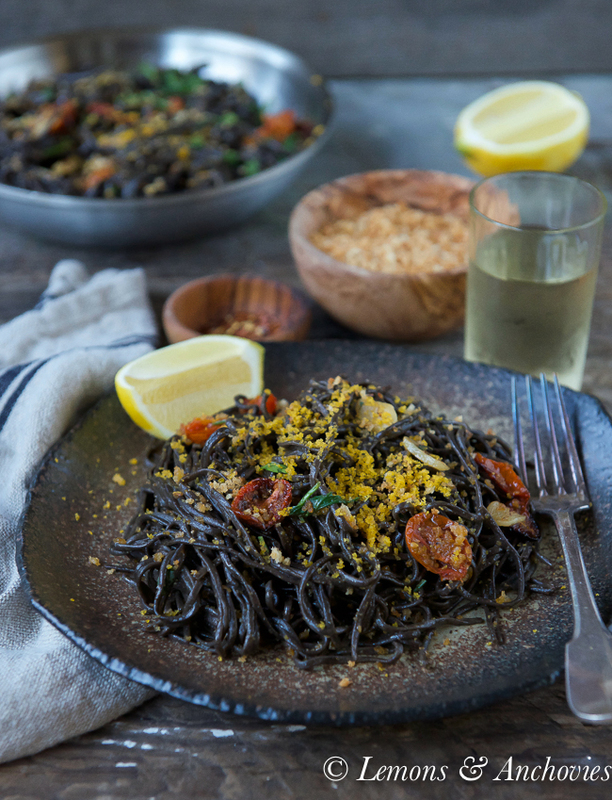 It’s one of my favorite pastas and the kids have developed quite a liking (loving?) to it, too. Nothing like carbonara to save the day when the pantry is bare. Come to think of it, I have a big slab of bacon in the fridge – I think this just may be dinner tomorrow! 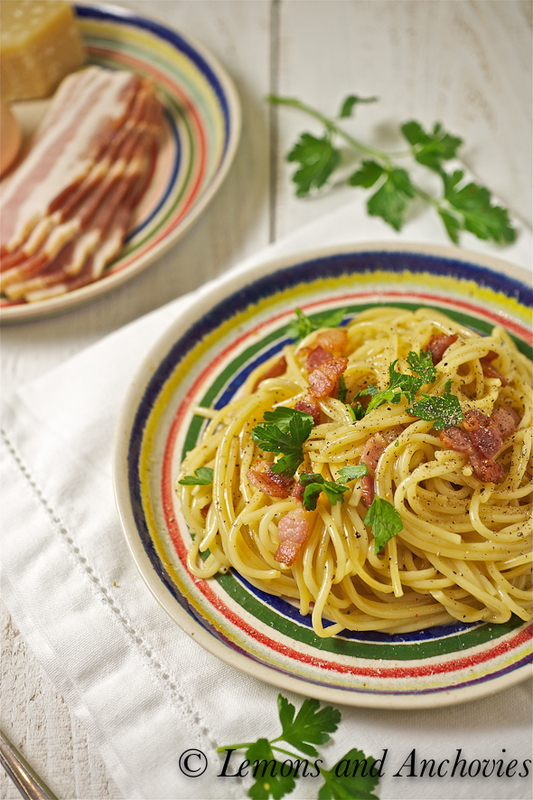 I love a good pasta dish without the cream 🙂 Your carbonara looks fantastic.I can’t wait to whip up a batch though i’ll have to use something else for bacons. Sounds like we had a similar high school experience. I was frequently thought of as a snob or told I was intimidating, when really I was just quite shy and suppose I still am. 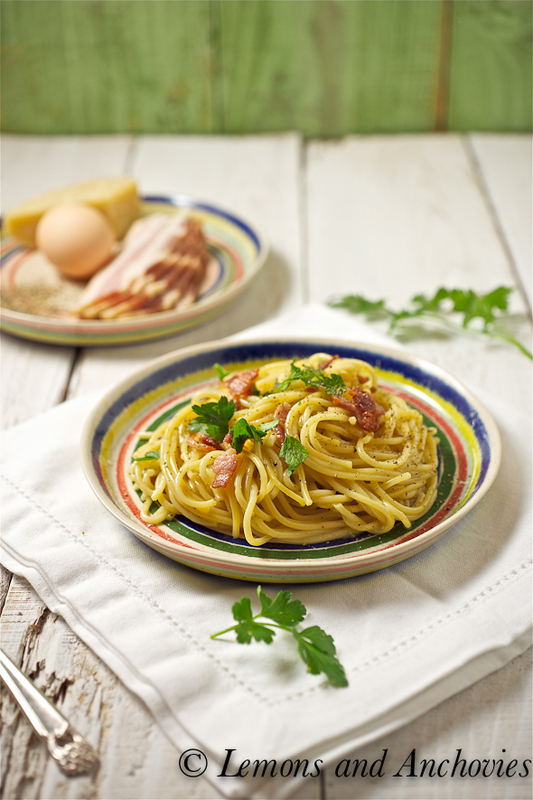 Your carbonara recipe is traditional perfection…beautifully done! From one Carbonara snob to another i’ll pass on a tip! A great way to avoid the scrambled egg issue is to whisk in a tablespoon or so of the pasta cooking water into the egg mixture to help temper it before adding the pasta. Works like a charm! Yum, Jean! One of our favorites! I lived in Rome as a teenager where this dish originated! Very nice rendition! Nothing like a bowl of pasta! one of my favorite pasta is carbonara (minus the bacon 😛 ) but i have a couple of bad memories. the scrambled eggs 🙁 will have to try your version. looks incredible good! Roxana, I ended up with scrambled eggs a couple of times, too, before I got the hang of it…thanks!! Hi Jean! I have been trying to make carbonara for a few years now, but I only make it maybe once a year. Every time, I’ve been slightly disappointed as the recipes haven’t been quite good enough – or I’m just not cooking it right. Haha. The last one I made a couple of months ago was good, but it was too creamy for me. My husband still liked it, but I have a feeling when i try your recipe for my annual carbonara, it won’t disappoint. I’ll let you know when I get around to making it. 🙂 Hope all is well & that you had a great time in SA. I LOVE carbonara, but I rarely make it. I’m also a snob about it, and alfredo. Usually when I decide to make one or the other, I also bust out my pasta maker, and do the pasta from scratch. I figure for such a simple dish, using the best, freshest ingredients makes all the difference. And how much more fresh does pasta get than making it yourself?!? If you’ve never tried carbonara with fresh, homemade pasta, I suggest it next time you make it. It elevates an already heavenly dish! I’m not a hugely gregarious person unless I know someone, so I have to work at it. I love making my own pasta and then the sauce. It’s an easy dish and with really fresh ingredients it always wows the crowd. How funny, I’ve got the same thing when I was younger. I think my shyness was mistaken for being standoffish but I guess we all see the same thing from different viewpoints. I LOVE Carbonara, but have never been brave enough to make it myself becuase of the raw eggs. Well I finally gained up the courage and made your recipie for dinner tonight! It was FANTASTIC! And I was so proud of myself for trying something new! Thank you for a great and not overly complicated recipe! Its wonderful! I only recently had traditional carbonara a few years ago and fell in love right away. I can’t blame you for sticking your nose in the air over any other kind. The egg makes everything so perfect and simple! This looks fantastic. My first experience with pasta ala carbonara was EONS ago when my roommate came back from a trip to the south of France. She made it for us and it became our go to meal–young, working in New York–it was inexpensive, easy and magnificently creamy and yummy (no cream) It really had that WOW factor.